The "Massage Mini" is a small but feisty massager. 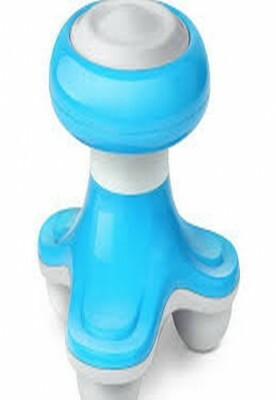 With its three massage heads, this massager is convenient and easy to use. You can use it to relax sore shoulders, neck, hands, feet, and even your face and head during your work day, for example. The three massage heads vibrate with the help of a motor. This vibration improves the metabolism of the area that is massaged, thus helping your muscles to relax. 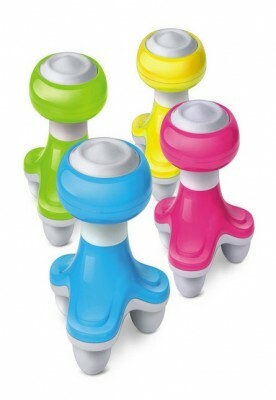 The massager is small and lightweight, and can easily fit into your purse or into the drawer of your work desk. The massager operates on three rechargable AAA batteries. Once the power is low in the batteries, you just plug the device to the charger and wait until the batteries are full again. After this the massager can be used normally again. A USB cable is supplied in connection to the massager, and it can be used to recharge the batteries easily through the USB port on a computer or a laptop, for example.